At the beginning of this year I set a few goals for myself in the kitchen. Learn to make pizza dough, learn to can veggies & fruits, learn to pickle, and learn to make falafel. I ask this all the time but -- what did we do before the internet? I mean seriously? When I want to make something I've never made before, whether it be a lace edging for a scarf or bran muffins, my first step is consulting Google. 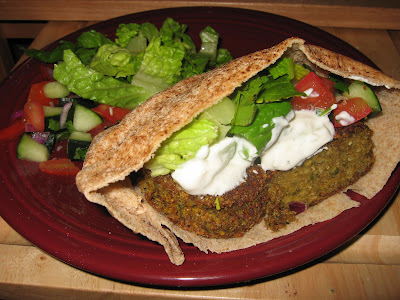 My "falafel recipe" search brought back around 353,000 results. Seriously...what did I do before the internet?Of the 300,000 plus pages - I only read about 15 recipes (I mean I have to do some work at work - I can't just surf the web all day) . Reading the different recipes allowed me to see what ingredients were staples in the recipe and which different process I could do to achieve the dish I desired to prepare. For example, after reading the various falafel recipes it was clear that re-hydrating chickpeas (which I had never done before) versus using canned chickpeas was the preferred main ingredient. One of the sites cautioned that using canned chickpeas would lead to sludge at the bottom of your blender. The recipe from The New York Times that I decided to make had all the usual suspects as far as ingredients went, but called for the patties or balls of batter to be fried in an inch of oil. I read several other recipes that gave instruction on baking the falafel, but I knew they needed to be super crisp and I wasn't confident that baking could make that happen. So I comprised: I pan- fried the less than a 1/4 cup flatten patties of batter for a minute or two on each side in a few tablespoons of oil, then baked them on a cookie sheet in a 450 degree oven for about 20 minutes. By not submerging the chickpea batter in oil, I hope I made them a little healthier. Falafel making wasn't pretty but it was worth it. My first concern began with the smell of the soaked beans. They smelled liked well... the toot from the fruit. My next concern was that there were too many beans to fit into one batch in my blender. So, I processed the chickpeas in batches adding a few of the other ingredients in with each batch. Once all the batches with together in a large bowl I used a potato-masher, and later my hands, to combine the mixture throughly. Once my hands were in the batter (did I mention it wasn't pretty), I realized that it would be a miracle if my mealy mixture would stay together during pan frying. I remembered that a few of the recipes had called for bread crumbs. That was exactly what I felt this mixture needed. So, I added about 1/4 cup bread crumbs, incorporating them by hand into the mixture. Then, I put a a few cups of bread crumbs in a roasting pan. After I formed each patty I gently laid them in the bread crumbs and lightly covered with crumbs. By this point, I was thinking about ordering pizza. But why stop now. I panned-fried the falafel patties in batches in about 2 tablespoons oil for each batch. After pan frying 1-2 minutes on each side, I baked them for about 20 minutes. They were awesome. I was proud of myself because on more than one occasion I considered throwing the sloppy mess out. But, they tasted so good I'll probably make them again. I served them on warm pita with diced up lettuce, cilantro, tomatoes, cucumber, and onions. I also made an impromptu cucumber-dill yogurt sauce. I just kept throwing things in the sauce till it tasted right. Some yogurt, some peeled diced cucumber, dill, lemon, garlic, salt & pepper. I don't have any idea the proportions because I just kept adding stuff till it looked and tasting like the sauces I used to eat in the Greek restaurants of Astoria, Queens. What are you making from scratch for this first time this year? great job! next time I'm sure it will be easier. Looks yummy! This really looks good. You better watch out the Rabbi will be knocking at your door. ooh, that looks so good! I love falafel... mmmm. I've been thinking about making baba ghanoush from scratch lately. I remember making hummus when I was in college, but I could never get the taste quite right... and I think it was because I had a bad batch of tahini. Sometimes, I day dream about Mediterranean food.